Mexico City is a very dense urban destination lacking adequate green space, and aching for more extensive public transportation. 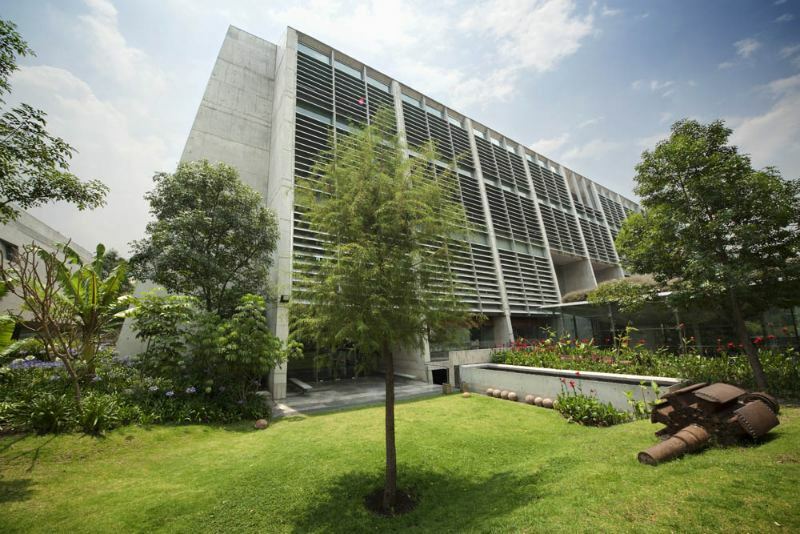 The Biblioteca Vasconcelos, designed by Alberto Kalach, is a recent addition to the urban landscape and is a dual purpose facility serving as both a public library and a botanical garden. The large glass, steel and concrete facility relies on daylighting and natural ventilation on the interior and is topped with plantings and vegetation at the roof. The whole of the structure is also surrounded by plants endemic to Mexico, on all its sides. The botanical garden, just like the books and computers inside the library is a source of knowledge and acts to educate the visitors of the library. 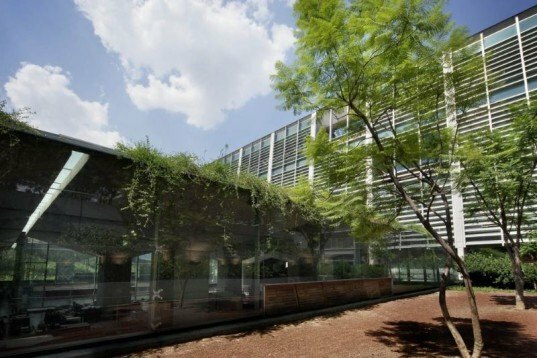 The Vasconcelos Library was built on barren landscape in the middle of the city and the surrounding gardens are part of an attempt at urban ecological regeneration. There are over 60,000 specimens of 168 species of trees, shrubs and herbaceous plants with over 26,000 square meters of garden area. The roofs of the building are also covered in vegetation and serve to insulate and protect the buildings below. Alberto Kalach and his team designed and built the “Megabiblioteca” during Vicente Fox’s administration and it was first completed in 2006, but had to undergo some major repairs before it reopened in 2008. The interior is out of a futuristic dream with cantilevered levels of books, translucent floors and walls, steel cross supports and large floor to ceiling windows. The library is also an attempt to reorganize human knowledge and the collection contains 575,000 books across 40,000 thousand meters of shelving. The botanical garden includes almost 60,000 specimens of 168 species of trees, shrubs and herbaceous plants. The garden is 26,000 square meters in size and was created to increase the ecological reach of the area. The library and garden was built on an empty urban plot in hopes of providing more urban green space. Large floor to ceiling windows allows daylight to flood into the space, while letting the visitors connect with nature outside. The roof of the building is also covered in vegetation and trees. The gardens include water features, shade structures and public art installations for visitors to enjoy. Inside, the library is a dizzy array of levels, book shelves, cantilevered balconies and more. Translucent floors, walls and panels help light filter through the stacks. The library was an attempt to reorganize human knowledge and maintains an interesting layout. The library includes 575,000 books and a multimedia collection including children's books, Braille, and music. The steel, glass and concrete building relies heavily on natural ventilation and daylighting. The interior includes a vast collection of books, a music room, kids room, Braille collection, an auditorium and conference rooms. Inside, visitors of the library can easily connect with the nature outside the space simply by looking through the vast windows.